There’s something unbelievably satisfying about braised short ribs. Brown them deeply, add some wine, stock and a few aromatics. Stick it in the oven for a couple hours and walk away. Something wonderful happens. Magical. It’s slow food. It’s good food. Braises with bones are better. Make no mistake. But there’s enough goodness in the short ribs that it doesn’t matter. Enough connective tissue. Enough marbling. Umami. Wow. I grab them whenever I see them. They make fantastic stew. And who doesn’t love stew? The generic beef stew meat at grocery stores is usually cut from the hip. It’s not good. Just look at it. 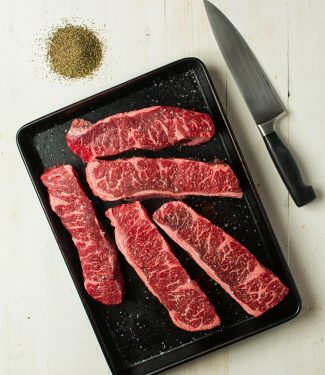 No marbling. No promise. No hope really. Your butcher can fix you up with chuck. That’s good. But if you can get short ribs… that’s great. 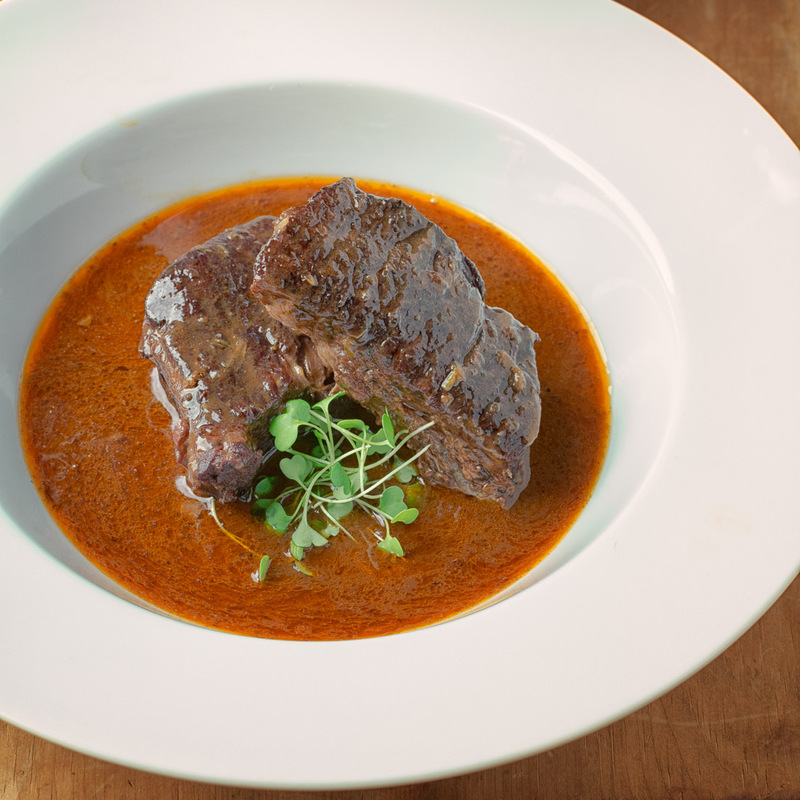 These braised short ribs strike a nice balance between a deeply flavourful sauce and tender, beefy meat. Serve them with a bit of crusty bread to sop up the leftover sauce. Or with a tangle of pasta. Tagliatelle works. You don’t want to serve them with a big pile of mashed potatoes though. That mutes the sauce. Let it shine. You made something awesome. You’re a star. Make sure everyone knows it. There aren’t a lot of ingredients this stew. No potatoes. No mushrooms. No carrots in the final product. It’s really important to use great ingredients to get a great result. There’s nowhere to hide. Good meat. Decent wine. Good stock. A few vegetables. And, in this case, a bit of pork. Pancetta in fact. Adds a bit of saltiness, a bit of richness. You won’t even know it’s there – but it adds a little something extra. The key to this recipe is the browning of the meat. This is critical. The Maillard reaction makes it what it is. There’s no short cut. No secret. Just wait. Tough it out. Brown the meat. Brown it deeply. Do this one thing and your guests will rave. These braised short ribs are all about the beef and the sauce. Don't skimp on ingredients. Your dish will only be as good as what goes into it. This serves 6 big portions but is enough for 12 in a multi-course meal. Heat a big dutch oven over medium heat. Add enough oil to generously film the pan. Working in batches, deeply brown the beef on all sides. Take your time. You are going to spend 15-20 minutes on this. It is THE critical step. This is where the depth of flavour comes from. This is magic. Once you have finished browning the meat spoon out all but about 4 Tbsp of fat from the pan. Add the pancetta and cook until golden - about 2 minutes. Reduce heat to medium low and add the onion, leek, and carrot. Cook, stirring occasionally, for about 10 minutes. Add the garlic and tomato paste. Cook 2 minutes more, stirring constantly. Add the wine. Bring to a boil and let simmer 5-10 minutes. Return the beef to the pot along with 4 cups veal or chicken stock. Make a bouquet garni and nestle it in with the beef. Cover the pot with a sheet of aluminum foil and then the lid. This creates a better seal and makes cleaning up easier. Place the dutch oven in the oven. Check for doneness after about 2 hours. You are going for fork tender. If it's not ready put it in and cook another 30 minutes. Check again. If it's still not fork tender then let it go another 15-20 minutes. It will be done by the 3 hour mark. Remove the dutch oven from the oven and remove the meat and bouquet garni. Discard the bouquet garni and tent the beef with foil. Strain the sauce, pressing down hard on the onion/leek/carrot mixture to extract all the liquid. If you can force a bit of the vegetable pulp through the strainer that's good too. It adds a little something but it's not critical. Return the strained sauce to the pot and simmer to reduce by half. This takes about 20-30 minutes. Return beef to pot and simmer to warm the beef through. 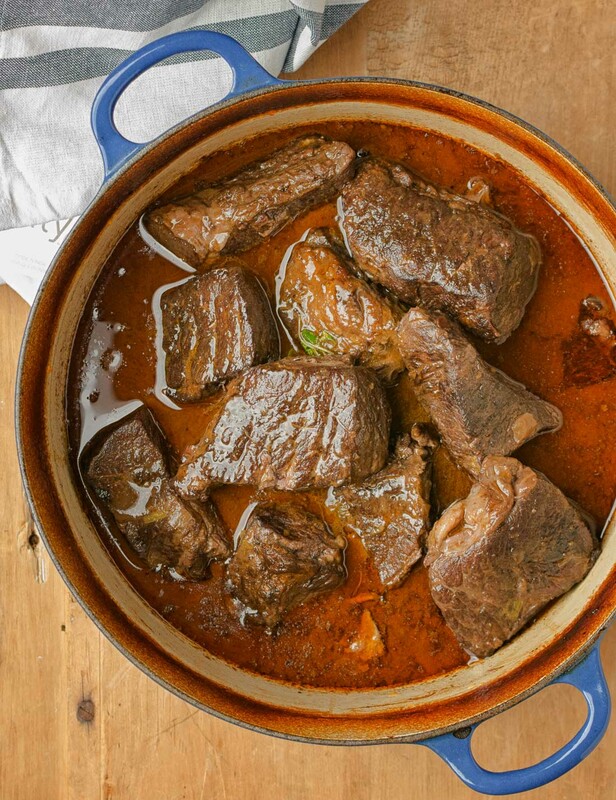 Serve braised short ribs and sauce with crusty bread. Or serve it on spätzle or tagliatelle. Take the time to deeply brown your meat. Browning meat creates all kinds of flavour compounds. It's called the Maillard reaction and it's fundamental to cooking. A bouquet garni is just the thyme and bay wrapped up in a couple of green leek leaves and secured with a string. It makes digging the thyme out much easier at the end. Chicken stock will do but if you can get veal stock it makes a difference. Wow that marbling!! This looks fantastic and SOOOO comforting. I love how you kept it simple and you used pancetta! Wow I could probably just sop up that sauce with a fresh baguette! Love this!! This looks fantastic! I feel like I always rush when browning meat, so thank you for the reminder to take my time! I want all that delicious flavor it looks like you have here. I would love this over pasta, or all on it’s own…so hearty! Try it on just a little bit blue-cheese mashed potatoes. Not too much or it will dull the flavour of the sauce. That’s crazy good. I also recently had a chance to try Parisienne gnocchi. That would be really good as well. Gorgeous pictures, Romain! I loooove short ribs. They make me think of fancy dinners out because I usually have them at nice restaurants. Now, I can bring the fancy dinner experience into my kitchen thanks to your awesome recipe! Love the simplicity of it– just the meat. Can’t wait to try it! Thanks Alyssa! I love short ribs too. I was extra excited to find these without the bone. I was worried not having bones in the stew to give everything that little extra oommpph but in the end I didn’t miss it at all. Be sure to really brown the meat to get all the flavour. 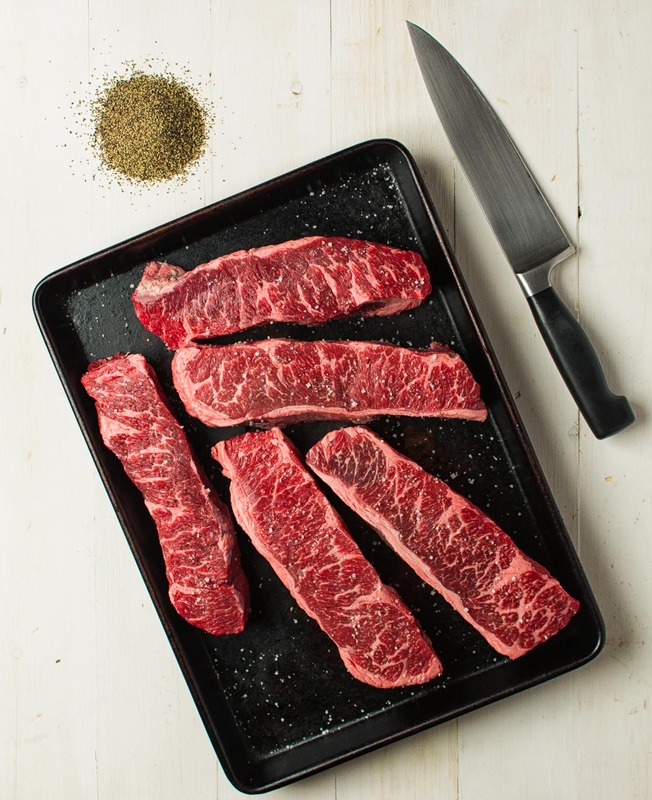 That marbling is everything! So much flavour and tenderness. I love the tips that you placed throughout this post too! That beef was irresistible. I hope the tips come in handy for you sometime. Happy anniversary! I hope the short ribs are anniversary worthy.